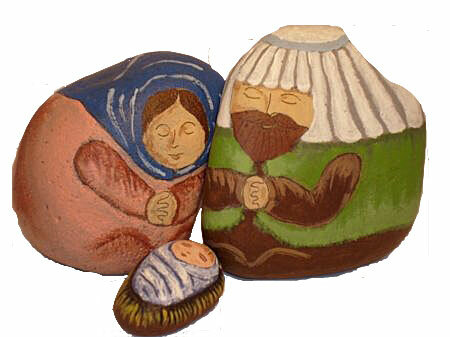 The shape of the rocks allow Mary and Joseph to nestle closely together admiring their sleeping Baby Jesus. Mary's robes are a peachy/pink color; her head scarf is royal blue. Joseph's robe is painted brown, his vest is leaf green, and his head band is light blue. Jesus' swaddling clothes are cornflower blue & white.